Thanks to Siri, OK Google, Cortona and our other occasionally confused, algorithmic-based friends, searching for goods and services in your neighborhood is now a simple voice command away. This has been a real game changer for traditionally localized services. Take our industry, for example, glass replacement and repair. Asking your mobile device to locate “glass company minneapolis” or “custom glass company near me” will generate mostly geo-specific results. This offers a far more level playing field than the yellow pages of the past when the biggest companies with the deepest marketing pockets would dominate the “glass and mirror” section in the phone book with full-page ads and loud graphics. Now, a locally-owned family business, such as American Glass & Mirror, has an equal chance of capturing your attention as a national chain. Level or Just Plain Flat? The other side of the coin is that Google may be narrowing your purview a little further than you’d like. 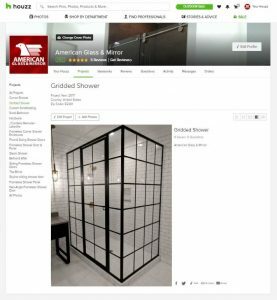 If you’re in the market for a custom shower and request “glass shower door near me“, Google will serve you up a map of shower door companies in your vicinity. How it selects those particular shops is a bit of a mystery. Google would tell you the list is generated using their sophisticated algorithm that weighs a number of factors including number and strength of reviews, website optimization, current proximity to business, etc. Straight forward enough, right? Maybe not… It seems more often than not we’re provided with a few high-quality options and then a number of questionable options with websites that have been around since the AOL era, companies trying to game the system by listing non-existent locations as actual physical locations, companies with really low reviews and companies that put zero-effort into cultivating an online presence, like failing to complete their business info on Google. Some of these issues aren’t indicative of a low-quality business, for instance, a dated website doesn’t necessarily mean you won’t receive professional work. Some of these issues are more problematic. If you search, “cabinet glass near me” and find a shop that is supposedly a couple of miles away – you’d be pretty pleased! But that would change pretty quickly if you drive over there and find not a glass business, but a city park or empty lot. You can chalk this inconvenience up to a company trying to climb the Google ranking using “black hat” methods. This kind of failure on Google’s part is annoying but less so than another unfortunate occurrence. Proximity to a business can be very important for some goods and services but much less so for others. No one wants to drive from Minneapolis to Prior Lake to pick up a small vanity mirror, so when searching “small mirror” a user needs to see options that are as close as possible. On the other hand, shower door companies offer mobile service and install anywhere in the Minneapolis-St Paul area. It doesn’t matter if the company is located in Eden Prairie or Lakeville, a Twin Cities shower door replacement company is going to be a convenient option because they come to you. When Google favors highly-localized companies for these kinds of services, you can be denied the option to work with a great glass company, like American Glass & Mirror. Just because a shower door company is located in your particular part of the metro area, doesn’t mean they’re the company you want to hire for your project. As a small, locally-owned glass company, we often hear customers express their desire to work with someone local. We appreciate this urge to support the small business down the road and keep money in the community. However, no one wants to support a lousy business. American Glass & Mirror has been part of the south metro ecosystem for 35 years, but more importantly, we make sure we’re competitive on price and provide unparalleled customer service. When Google gives you a narrow lens on glass service options, they’re limiting your ability to find the right company for you. From a small businesses perspective, it seems we may have traded one obstacle for another in the paradigm shift from yellow pages to online ranking. 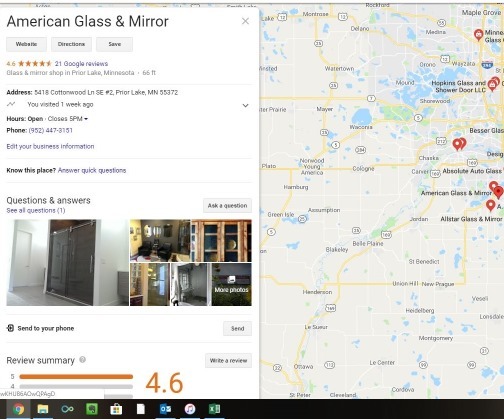 Given the multitude of options Google serves up to you, how can you be sure you’re going with an experienced, customer-service oriented MN glass company? Here are several useful review sites and what to keep an eye out for in determining if these companies are worth a call. This is the first place most of us turn when starting to look for goods and services. The obvious place to start is the map listing at that top. As I stated before, for some goods, like replacement glass for a small storm window, we’re not going to drive across the city. Using a business from across the Twin Cities isn’t an inconvenience when using a mobile service, so locality doesn’t play as much of a factor. That said, a lot of people want to support local businesses, which is really great, it just may not be the primary consideration for choosing who to use for auto glass installation or other mobile businesses. Look at the company’s profile. Is it complete? Are there business hours listed? Are you able to view photos of past jobs? How about reviews? Are they above 4 stars and how many reviews do they have? You’d probably feel more assured of a company with 4.6/5 stars with 16 reviews than you can with a 5/5 star company with only two reviews. How does the company handle negative reviews, are they combative or conciliatory? Further down the list from the featured listings are the on-page listings. It’s worth clicking on a number of these to get a feel for the companies. What kind of impression do you get from their website? Do they seem professional? Often times the level of care put into this is reflected in the detail-oriented quality of their work. Are their grammar errors? Is it awkwardly written? Do they have photos from their own projects or are they using all stock images? Another thing to look for is reviews customers have given them on their website. Look for authenticity and praise from contractors in your area. Another great site for vetting glass companies is Houzz. This is a social media site that is often used by builders and designers and has great conversations about all things HOME. Check out what other industry professionals are saying about the company and who they’re working with. Also, take a look at the sort of projects they’re involved in. Do they look like a company with a lot of experience that can tackle a range of products and applications? What does the end result of their jobs look like? Lastly, I would recommend doing some investigation on Facebook. As with all of these other sites, check out the reviews. Do they feel genuine? Who are they working within your community? What sort of image do they project? There are a number of other social media sites that will give you insight into what glass company is best for you to work with. The takeaway is doing your homework! Don’t just settle for the first company Google offers up, especially with a major purchase like a frameless shower door or replacing insulated windows in your home. Happy hunting!